The President stood at the rail of his friend’s yacht, the Oneida, watching the waves from Long Island Sound roll and tumble over each other. His fingers itched for his fishing rod. He had fished from this yacht many times in the past, but this time was different. This time, he faced something more serious than how many fish he caught. His tongue explored the contours of the tumor growing on the roof of his mouth. The economic panic threatened the country like his tumor threatened his mouth. He didn’t want to call it cancer. Cancer, the forbidden word that translated into a person just as forbidden. The operation to remove the growth from his mouth had to remain secret for the good of the country and for the good of his family. Stephen Grover Cleveland, the 22nd an 24th president of the United States, often pushed his favorite relaxing activities- fishing and sailing- to the back on his mind and life as he conducted his presidential duties. His second term that began in March 1893 proved to be especially trying, both nationally and personally. President Cleveland won his second term in 1892 on a platform calling for the Repeal of the Sherman Silver Purchase Act of 1890. The Democratic Party had split into two factions – the conservative pro business gold standard faction that President Cleveland led and the free silver faction that William Jennings Bryan headed. Campaigning on a sound money platform, President Cleveland carried his party only by choosing free-silver advocate Adlai Stevenson as his running mate. President Cleveland led his party in the drive to repeal the Sherman Silver Purchase Act of 1890, and he had scheduled a special session of Congress to meet on August 7, 1893. Bank failures, a railroad bubble, and a run on the gold supply, ushered in a serious economic depression called the Panic of 1893 that swept the country. Besides dealing with the deep depression, President Cleveland also coped with persistent office seekers and anxious Americans wondering how to get their next meal and keep a roof over their heads. On a personal level, he and his wife Frances had a two year old daughter named Ruth and Frances was pregnant with their daughter Esther who was born on September 9, 1893. In May of 1893, President Cleveland discovered a growth on the roof of his mouth near his molars on the left side – the side where he chewed his cigars and smoked his pipes. The tumor continued to grow and on June 18, 1893, Dr. R.M. O’Reilly, the official medical attendant for Government officers in Washington, examined the growth. He pronounced it an ulcer as large as a quarter, encroaching on the soft palate and some diseased bone. Dr. O’Reilly removed a small piece of the tumor and sent it to the pathologist at the Army Medical Museum without telling him the name of the patient. The pathologist reported that the tumor was malignant. Dr. Bryant advised President Cleveland that the tumor was malignant and to have it removed immediately. The President agreed with certain conditions. He felt that any sign of ill health would signify weakness and favor the pro-silver side. He decided to keep his operation secret and that the Oneida would be the best place for the secret operation to take place. President Cleveland’s close friend banker and Commodore Elias Benedict owned the Oneida, a luxury yacht, and the President had already logged at least 50,000 miles on the Oneida fishing in Long Island Sound and off Cape Cod. When he disappeared on the Oneida for four days, people would think he had simply gone on another fishing trip. Another Fishing Trip on the Oneida? Even one fishing trip on the Oneida was a voyage into luxury. In 1883, John Roach, a self educated Irish immigrant who created iron shipbuilding in the United States, built the Utowana, later renamed the Oneida at the Delaware River Iron Ship Building and Engineering Works at Chester, Pennsylvania. He built yachts for rich and well known people and he also built the United States Navy’s first fleet of modern warships. He died in 1887, ironically enough of cancer of the mouth. 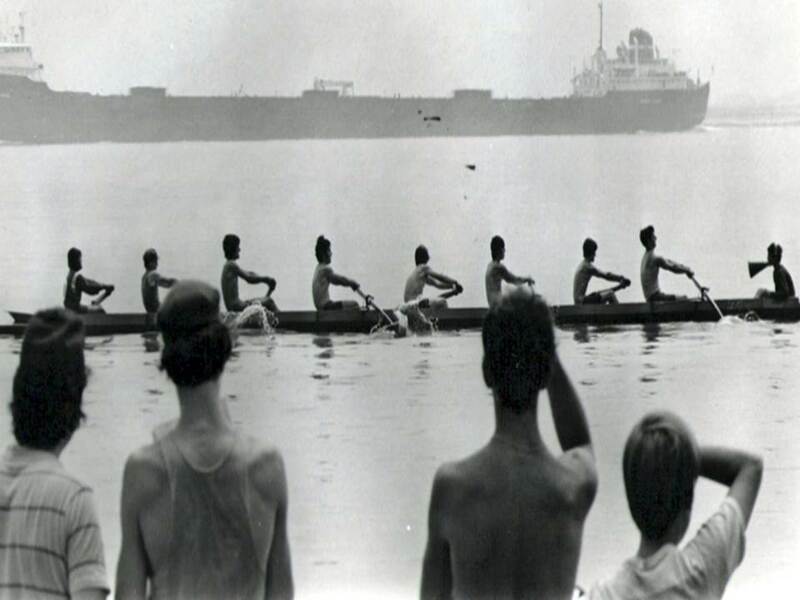 In 1885, the Utowana won the Lunberg Cup, an international race. In 1887, Elias Benedict, a banker and a fanatical yachtsman, bought the Utowana, refitted it for comfort and speed and renamed it the Oneida. The Oneida measured 138 feet and featured an iron hull, two masts, and a steam engine. She could make 13 knots and accommodate a dozen passengers in her plush below deck quarters. She combined a schooner’s elegance, a steamer’s speed, and a luxury liner’s comfort. Commodore Elias Benedict hosted famous guests on the Oneida including Edwin Booth, Thomas Bailey Aldrich, Lawrence Barrett, and his close friend President Grover Cleveland. 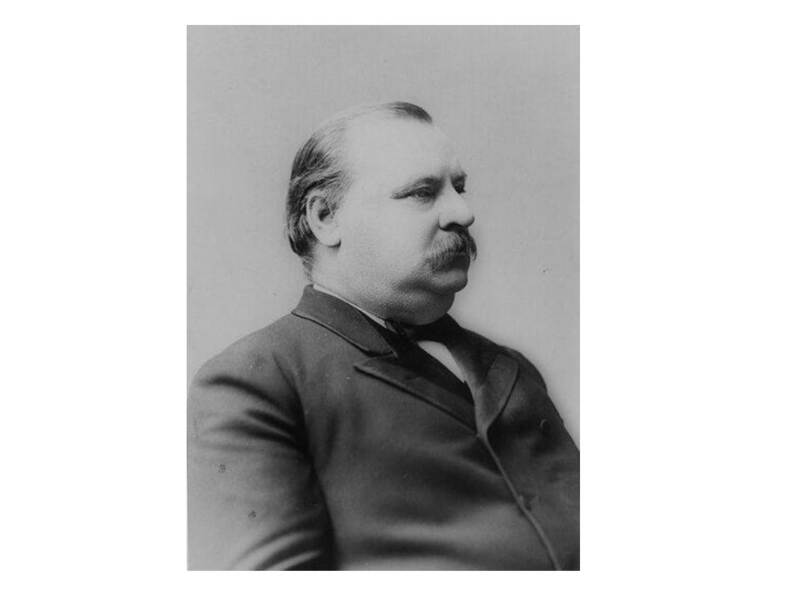 President Cleveland announced that he would take a four day fishing trip on the Oneida from New York to Gray Gables, his summer home in Cape Cod. The President’s personal physician Dr. Joseph Bryant of New York assembled a team of doctors to perform the operation. He first recruited Dr. William Williams Keen of Philadelphia, who six years before performed the first successful operation in the United States to remove a brain tumor. Dr. Bryant also enlisted three other doctors and a dentist to complete the team that would operate on the President. Next, Dr. Bryant turned his attention to transforming the small dark saloon of the Oneida, anchored in the East River, into an operating room. The crew removed all of the furniture except the organ- it was bolted to the floor- and cleared and disinfected the room. They lashed a large chair to the mast in the center of the saloon to use for an operating table. A single electric bulb connected to a portable battery provided the only supplement to natural daylight. Dr. Bryant arranged to have other pieces of necessary equipment including tanks of oxygen and nitrous oxide secretly delivered to the Oneida. He told the Oneida’s crew that the President had to have two teeth removed when they wondered at the accumulation of medical equipment. In a September 1917 article published in the Saturday Evening Post, Dr. Keen wrote that he arrived in New York City on the evening of June 30, 1893, made his way to Pier A, and traveled to the Oneida lying at anchor quite a distance of the battery. Dr. E.G. Janeway of New York; Doctor O’Reilly. Dr. John E. Erdmann, Dr. Bryant’s assistant and Dr. Ferdinand Hasbrouck, the dentist, had already arrived and were ferried to the Oneida from different piers. President Grover Cleveland left Washington on June 30, 1893, after he issued a call for a special session of Congress on August 7, 1893 to repeal the silver clause of the Sherman Act President Cleveland, Doctor Bryant, and Secretary of War Daniel S. Lamont arrived from Washington at a later hour, drove openly to Pier A, and were ferried out to the Oneida. 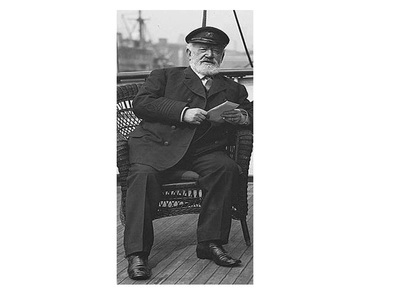 When President Cleveland arrived aboard the Oneida, he lighted a cigar and he sat on deck with the doctors and smoking and talking until nearly midnight. He spent a restful night without any sleeping medicine. The next morning President Cleveland thoroughly cleansed and disinfected his mouth, but he did not shave off his mustache. The Oneida weighed anchor and started up the East River. Doctor Bryant and the other doctors hurried from the deck to the cabin when they reached the Bellevue Hospital at Twenty Sixth Street, fearing that some of the staff might recognize them. In the salon, the doctors boiled their instruments and pulled white aprons over their dark suits. Shortly after noon, President Cleveland came into the room and sat in the chair. The doctors anesthetized him with nitrous oxide and ether. As the Oneida crossed Long Island Sound, the doctors operated on the President of the United States. According to Dr. Keen, the doctors worried more about the dangers of the anesthetic than the dangers of the operation itself. After all, at age 56 and very heavy with a short, thick neck, the President was a candidate for apoplexy- a stroke. In an operation lasting approximately 90 minutes, the doctors removed the tumor, five teeth and much of the President’s upper left palate and jawbone. They performed the surgery entirely within the President’s mouth using the cheek retractor that Dr. Keen had brought back from Paris in 1866 to make sure that the President wouldn’t have external scars. They even left his bushy mustache intact. Four days later on July 5, 1893, the Oneida deposited President Cleveland at Gray Gables, his summer home on Buzzard’s Bay. Two weeks later, again on the Oneida, the doctors performed a second operation to remove more suspicious tissue. By the middle of July, Dr. Kasson C. Gibson, a New York prosthodontist arrived at Gray Gables to fit the President with a vulcanized rubber prosthesis to fill the hollow in his palate and restore normal speech. Just a few weeks after his operation, President Grover Cleveland talked and fished in Buzzard’s Bay like he had never endured an operation. A July 9th story in the Brooklyn Eagle sounded a slightly more ominous note by reporting that President Cleveland was ill with an attack of rheumatism confining him to his room. The story quoted Secretary of War Lamont as saying that the President couldn’t have visitors until he felt better, but his condition was improving. The real story with surprisingly accurate particulars broke in the Philadelphia Press on August 29, 1893. Elisha Jay Edwards, the 46 year old New York correspondent, had heard about the operation from a doctor friend who had heard the story through the medical grapevine. Elisha Edwards confirmed the story with Ferdinand Hasbrouck, the dentist who had anesthetized the President on the Oneida. After his operation, President Cleveland had recovered enough to return to Washington for the special August 7, 1893 session of Congress and by August 28 he had convinced Congress to repeal the Sherman Act. On September 5, 1893 he officiated at the First Pan-American Medical Congress in Washington, speaking with a clear and resonant voice and two weeks later he spoke at the Centenary of the Founding of the City of Washington. He displayed no scars from an operation, and his voice and general health appeared normal. Many newspapers endorsed the story of the President’s secret operation, pointing out the recent false denials of doctors in the case of General Ulysses Grant and other public figures. They pointed to Secretary of War Lamont’s statement that the President was “a sick man – how sick we cannot tell-“paralleled the actual facts. Just as many newspapers branded E.J. Edwards a “disgrace to journalism.” Despite the blow to his journalistic integrity, E.J. Edwards continued working into the Twentieth Century. In 1909, he became a columnist for the young Wall Street Journal, but accusations that he had faked his story about President Grover Cleveland’s secret operation followed him throughout his career. In 1917, only three witnesses to the operation on the Oneida were still alive- Dr. Keen, Elias Benedict the Oneida’s owner, and Dr. John Erdmann who had been Joseph Bryant’s assistant during the operation and had become a prominent surgeon. Newspaper man E.J. Edwards had also survived to finally hear his Philadelphia Press story corroborated. After Dr. 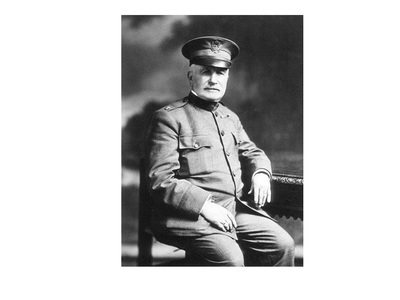 Keen published his account of the President’s operation on the Oneida, E.J. Edwards received hundreds of congratulatory letters and telegrams. A few questions about the nature of the tumor still lingered after Dr. Keen’s Saturday Evening Post story. In 1975, modern doctors reexamined the tissue from President Cleveland’s tumor and concluded it was a verrucous carcinoma of the hard palate and gingival, a diagnosis that matched the opinions of Dr. O’Reilly, Dr. Keen and others who had identified it. Tobacco and alcohol use can sometimes produce a verrucous carcinoma, and surgically removing it is usually the cure for the tumor. When ex-president Stephen Grover Cleveland died on June 25, 1908, his friend Commodore Elias Benedict and the Oneida still survived. 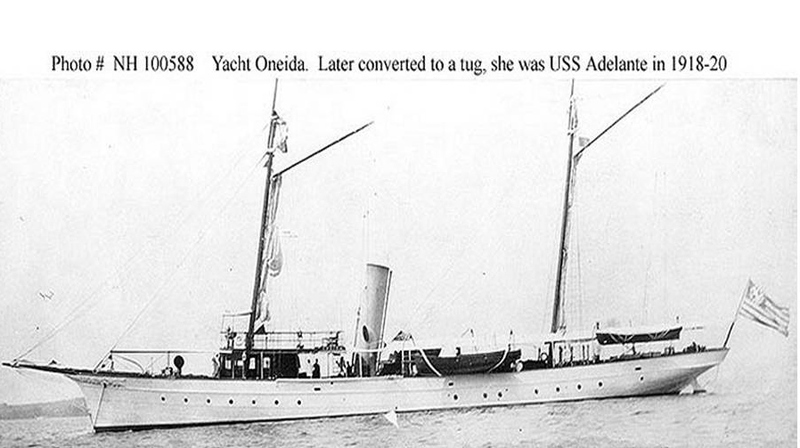 In March 1913, Commodore Benedict bought a larger yacht that he also named the Oneida. 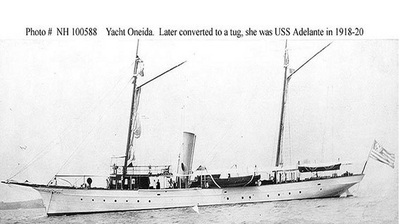 He renamed the previous Oneida the Adelante and converted her to a tow vessel. The United States Navy commissioned the Adelante as the USS Adelante (SP-765) on December 17, 1918 at Lawley’s Shipyard in Neponset, Massachusetts, with Lt. Edwin W. Keith, USNRF in command. On February 24, 1919, the Adelante dressed ship to commemorate the Boston arrival of President Woodrow Wilson on board the transport George Washington as part of the armada of ships that greeted him as his ship arrived in President Roads. The Adelante next went to Portland, Maine, and then moved to Damariscove Island where she helped convert and construct a network of wartime radio compass stations along the Maine coast for peacetime use. She also served as a boarding boat for ships including the Battleship New Jersey until the Navy eventually decommissioned her in Boston on August 18, 1919. On March 25, 1920, J. Daniel Gully of Brooklyn bought the Adelante and renamed her John Gully. By 1924, the H.J. Wheeler Salvage Company, Inc., of New York bought the John Gully and renamed her Salvager, operating her until 1927. In 1927, the Salvage Process Corporation of New York bought the Salvager and operated her until 1940. By January 1, 1941, the company had abandoned the Salvager because it was old and deteriorated. The Oneida’s owner, E.C. Benedict, served as a pallbearer at his friend Grover Cleveland’s funeral in 1908, and Dr. Joseph Bryant rode in one of the funeral carriages. After Commodore Benedict sold the Oneida and her name and purpose changed, she made more years of history. When she ended her life as the Salvager, old and deteriorated, the ghosts of pleasurable fishing trips and important voyages remained and the Oneida still rides sunlit waters and moon washed waves. Algeo, Matthew. The President Is a Sick Man: Wherein the Supposedly Virtuous Grover Cleveland Survives a Secret Surgery at Sea and Vilifies the Courageous Newspaperman Who Dared Expose the Truth. The Chicago Review Press, 2012. Keen, William Williams. The Surgical Operation on President Cleveland in 1893. Philadelphia: George W. Jacob & Co., 1917. Nevins, Allan. Grover Cleveland: A Study in Courage. New York: Dodd, Mead & Company, 1933. Reed, Lawrence W. Lesson from the Past: The Silver Panic of 1893. Foundation for Economic Education, 1993. Dr. W.W. Keene. Sept. 22, 1917 Saturday Evening Post on pages 24-55.